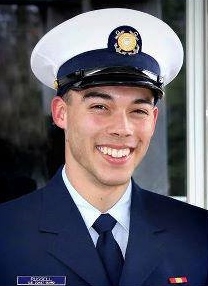 Derek Russell, a Hollis Center native and member of the Coast Guard, died Dec. 22, 2012 after a hiking accident in Kodiak, Alaska. He was 20 years old. Russell was a fireman aboard Coast Guard Cutter Munro. FN Russell left the base in Kodiak around 10 a.m. Dec. 22 to hike the nearby Barometer Mountain. Coast Guard crews along with other rescuers committed hours to searching for him after he did not return to base. Offiicals say FN Russell slipped on a trail, fell more than 500 feet and died instantly. His remains were recovered three days later, on Christmas Day. Russell attended Master’s House School at the New Life Christian Fellowship in Biddeford. He then attended Biddeford High School for two years, where he excelled at soccer and track. He left Biddeford High after his sophomore year to attend Calvary Chapel Christian Academy in Orrington. He graduated in 2011. Following graduation, Russell spent three months in Italy with his sister and uncle. His mother joined them in Italy for the last three weeks of their vacation. The family hiked extensively. Soon after, Russell left for the Coast Guard training center at Cape May, N.J. He graduated in late February. He was assigned to the Munro in Kodiak in March. He was a fireman on the ship and worked in the engine room. His mother said he intended to make a career in the Coast Guard. FN Russell is remembered as a “cool and easy-going guy,” who stood out among his peers for his sensitivity and kindness. His faith in God was very important to him. He is remembered by his family for his love of the outdoors and his passion for life. He was a bit of a risk-taker, who thought nothing of diving from the cliffs at Indian Cellar into the Saco River. In addition to his mother, Russell is survived by his father, David and Josiah Bruns and Eliza Hennessey. FN Russell had a close bond with his sister Mercedes, who was his best friend. I remember the day Derek told me he wanted to join the Coast Guard. It was the fourth of July, and we walked down the breakwater off a beach in Kennebunkport. You could walk all the way down and sit and just watch the sea. You’d sit and it was there, right at your toes! It was raging that day, and we were waiting for the fireworks. Coast Guard boats zigged and zagged through the channel and back out again. As we watched, Derek talked. He said he wanted to defend as close to the nation as possible, and that speaks to the kind of man he was. I never felt afraid when he said he wanted to serve. He was was the kind of man that could help people understand his point of view with an astounding sense of responsibility and peaceful beauty. Ever since Derek, I’ve never met another who could talk like him, and boy do I miss our talks. What a gorgeous soul, what a blessing it was to have him by my side. We shared an irreplaceable bond, the kind that makes me all the better just because I knew him. The love I have will never fade for my Rocket man. Derek was one of my best friends. I had so many phone calls with him leading up to him joining the coast guard. He was so passionate about it and excited. He was never scared and I was never scared for him because he was Derek: calm, steady, strong, and invincible. He taught me how safe felt. He was always a protector, and I could always count on him. He had the kindest heart and a beautiful old soul. I will always miss him, and he will forever be a hero. On Memorial Day weekend, I had the privilege to hike with Derek’s stone and share his story with others. In the weeks leading up to the hike, I had the opportunity to learn more about who Derek was as a man. Most importantly I was able to find out more about who he was as a son and a brother. Derek’s strong bond with his sister is very telling of the type of man he was. Even after his passing, he continues to have a positive impact on her. I admire the patience, love and kindness that he brought into relationships with those around him. Derek’s love for hiking is something that I share with him. There could not have been a more fitting place to carry his stone. At the summit of Owl Mountain, I was able to reflect on this journey, and share Derek’s story with the other hikers in my group. I shared with them about his compassion and respect for others, and his hunger for adventure. Derek has now not only impacted my life, but he has most definitely impacted the lives of those 10 other hikers. Thank you for the opportunity to carry Derek’s stone, and for your willingness to share such personal stories with me. Looking forward to seeing you again soon. The Coast Guard’s motto is to always be ready and prepared for anything. Derek lived his life diligent and Always Ready. Over the past week, I have continued to process the events that took place over this Memorial Day weekend in 2018. I prepared to join a group of strangers along with the mother of Derek Winn Russell on a hike up a mountain. We would talk about those who served our country and share their lives with each other. I could not have prepared for what took place. Derek Winn Russell died at 20 years old while climbing Barometer Mountain in Kodiak Alaska. I am sure that on December 22nd, Derek went up to the top of that mountain to be closer to the heavens and sing praises to his Father above. He never hid his faith in God, but instead shared his joy in knowing that someday he would be with him and wanted everyone to be there too! My weekend began at the exit in Hermon, following the last car in the convoy headed to Millinocket. My emotions grew as I saw the long line of bikes, trucks, cars and State Police making their way to Baxter State Park. I watched as fireman and police saluted and others waved flags on top of overpasses, showing their gratitude for these soldier’s service to their country. Once off the exit, there were Veterans, Scout Troops, Servicemen, Shop owners and Community Members standing along the route proudly flying the Flag and waving as they too remembered. When I arrived at NEOC, quite unsure of what to do next, I was greeted by so many who I soon realized were mothers, fathers, sisters, brothers and friends of these Maine Soldiers. The Riders handed off each Stone to families and at once I became aware of The Summit Project’s true purpose. Through tears, they read the names of each Soldier whose Stone and story they carried for over 200 miles. These names would soon become very familiar, as I met their family and friends and listened to pieces of their lives shared with us through each hiker. I had the honor and privilege to not only carry Derek’s stone but also to hike alongside his mother Suzanne. So many times, during the weekend, I’d see glimpses of Derek in her. Her facial expressions, her mannerisms and especially her smile. At times, seeing her smile would hit me like a jolt of electricity, and then a calm peace would come over me instantly. Her strength was enormous, as she carried another Mother’s stone while walking alongside her own. How many of us could do that? Derek was a part of our family, he met my oldest daughter in High School in 2009 and they quickly fell in love and in 2010 were engaged with plans to be married in 2011. During this time, Derek gave our family so much joy. He loved our daughter so much and we truly loved him like he was our son. The first time I drove him to where he was living in Orrington, as we left he waved goodbye from the front steps and then ran down the driveway and up the road continuing to Smile and Wave goodbye until we couldn’t see him anymore. That moment solidified his permanent spot in our hearts. I’m so glad that he loved my daughter. She went from being so broken to a girl who was loved completely. He showed her how beautiful she was inside and out. He respected her and let her know she was worth so much more than she felt. It was so wonderful to watch his gentleness melt away the hardness that had been brought on by others before him. I know that the time they had together was short, but he impacted her life forever. After he graduated from high school and he and my daughter had broken off their engagement, we remained family. He was so proud to tell us he had joined the Coast Guard and that he was going to serve not just God, but his Country as well. This was his way of Paraphrasing Isaiah 43:18-19. I can hear him saying this so clearly and I know that although his life was short, it was so completely full. Derek looked at life one day at a time. He didn’t worry about things he couldn’t control or about things that might happen, only God knew, and he had all the control. He just set out to live each day to its fullest. “Under the wings of God is an ultimate place of healing, restoration, building, changing and love. I want to fill my potential and purpose! I want to make my Heavenly Father proud! This hike provided a new perspective on life and knowing that each day is so precious. It was so much more than a hike up a mountain, it was the beginning for me as I joined a family! These strangers now mean so much to me and I’m focused on what the future holds for us as we set out to continue sharing these lives with others. We proudly fly the American Flag as a symbol of Freedom which we only have because of so many who gave their all! I pray each day that no additional Stones are needed. I pray for strength and peace for these families as they go on with their lives. I hope they find comfort in knowing that like ripples in the water, their stories are spreading on throughout the world, reminding us that life may be too short and to not waste a minute of it! All my love to Derek and his family; his smile is shining on us! Beautiful words of love for Derek. We loved him too and he meant the world to us. There will always be a spot in our heart for Derek. Thank you for sharing what you know and love about Derek. I love that you had letters that I had never seen where he is sharing so much of himself. This a beautiful treasure for me. I love him so much and miss him. Reading this keeps him close. Would his mom want me to bring his stone to Alaska? That was the question I wrestled with for a couple of weeks. I had to go to Alaska for work and decided to stay over Labor Day weekend to go hiking. Why not bring someone’s stone and story with me to make my time there more meaningful? Then I remembered. USCG FN Derek Russell died in a hiking accident on Barometer Mountain in Kodiak, Alaska a few days before Christmas 2012. I had gotten to know his mom over the past year and wondered whether I should ask her if I could bring Derek’s stone to Alaska. Not only did she say yes, but she went out of her way to help me get the stone before my trip. We brought Derek’s stone on a hike in Kachemak Bay State Park and then up Flat Top a couple of days later. The story I shared focused on his character: his desire to serve and protect. He committed to protecting our country but he also protected the vulnerable around him and befriended people who needed it. My cynical side regularly questions people’s faith in their God especially when their actions seem to contradict what I expect to see from a faithful person. But then I learn about Derek and how he seemed to truly live his faith through his actions, even at a young age. Kind of gives me hope. There is a Coast Guard quote: “You have to go out, but you don’t have to come back.” Hopefully, carrying Derek’s stone in Alaska and sharing his story with the folks I hiked with brought him back a little. It did Barbara. Thank you for taking his stone back to Alaska! To all of Derek’s family and friends – On 29September2018, I had the honor and privilege to carry the story and stone of your son, brother and friend, Fireman Derek W Russell, United States Coast Guard on Cadillac Mountain. It was humbling for me to receive Derek’s Tribute stone, and an honor for me to carry his story that day. Derek was still a very young man when he passed away. His aspirations for his life and career were beginning to take flight. His path seemed to be straight forward and upward. I wonder where it would have led. As I learned more about Derek, I found a connection that he is another small town kid, like me. I learned that he and I share a love for the outdoor lifestyle, and for adventure. He also lived his life with a strong sense of Faith and a desire to share that with his friends. He put his faith into action by befriending many and protecting them along their way. As he was growing up, he also learned about loyalty and service. His desire to protect our country by joining the Coast Guard in 2011 allowed him to be “close to home”, and serve all of us. I think that was another way that he gave Action to his faith by committing to our protection. Going forward, I will continue to share Derek’s story with my friends and others. While this cannot bring Derek back, I hope that it helps to pay his sacrifice forward so that others find inspiration in the life of your hero so that his legacy can continue making an impact on future young leaders. I’ll share his story with my friends on future hikes and adventures. I will look upward at times and call his name out, knowing that he’s smiling down at us (even in the rain). Semper memento Derek – We’ll keep sharing your story with the next generation.